Over the past year we've occasionally explored various sea glass colors, their relative rarity and the history behind their "previous lives" as actual glass products. Read on for details on a small section of the rainbow that can be found on our beaches. Unless glassmakers were looking for their product to have a special color, they’d leave it in its natural seafoam state. As a result, there’s a huge amount of glass out there in this color – old and new, and mostly mass-produced – from old windshields to modern vases. Lots of beverage bottles have been made in this shade over the years. After all, why bother tweaking the color of what’s essentially a disposable item? But seafoam green is probably most associated with a single kind of soda bottle: Coca Cola. For decades, the classic Coke bottle was made in varying shades of this soft color, with the intensity of the green varying with the location of manufacture. So many were made and tossed in the last century that it’s highly likely that any given piece of seafoam green glass started life as a Coke bottle. To rid their product of its natural iron-green tinge, 19th- and early 20th-century glassmakers turned to manganese. The naturally occurring metal clarifies the glass, cancelling out the effects of other metal impurities. But cobalt oxide has always been pricey. As Richard LaMotte, the authoritative voice on collecting, points out in his splendid book "Pure Sea Glass," the additive’s cost meant that it wasn’t often used to make beverage bottles, which were big and needed to be made in large quantities. Instead, cobalt glass was usually reserved for medicine bottles – think Milk of Magnesia, Bromo-Seltzer and Vick’s VapoRub – and as a result, they were usually tossed away near homes as opposed to dumped offshore. That means it’s not as common as other sea glass colors. While a piece of cobalt blue glass is not nearly as rare as a ruby red shard or a yellow one, it's still something of a prize. Similar to cobalt blue is the slightly paler cornflower blue, made with smaller amounts of cobalt oxide. It is to cobalt blue what pink is to red: a softer, gentler version of the same color. It’s more rare than cobalt, and a fun find. The reason it’s such a prize is that not a lot of glass products were ever made in red, because it was comparatively very costly to make. The main ingredient in most red glass – the one that is responsible for the color – is gold chloride. Legend has it the method for making red glass was discovered who knows how long ago when some glassmaker of old accidentally dropped a gold coin in a vat of molten glass. But gold isn't the cheapest metal around, and making red glass was a tricky business besides the materials cost. Even slight variations in the amount of the gold compound added to a batch of glass would yield dramatically different shades. Since consistency is key in making commercial products, it often just wasn’t worth it for glassmakers to churn out red. Of course, less red glass in circulation meant less red glass in the ocean, and thus less on the beach. 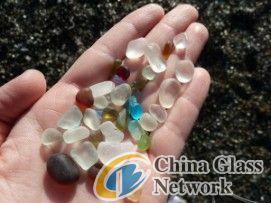 Modern methods use compounds of metals other than gold to get red glass – Selenium and Copper can both be used – but during the last century, when much of the sea glass we find on our beaches started its life as bottles and plates, red was rarity.